In the summer of 1997, my friend and I hitchhiked from Whistler to Seattle to see the Magic World Championships. We made good time, despite our getting detained by the American border police en route for naively walking through an opening in the fence at the Vancouver Peace Arch Park. 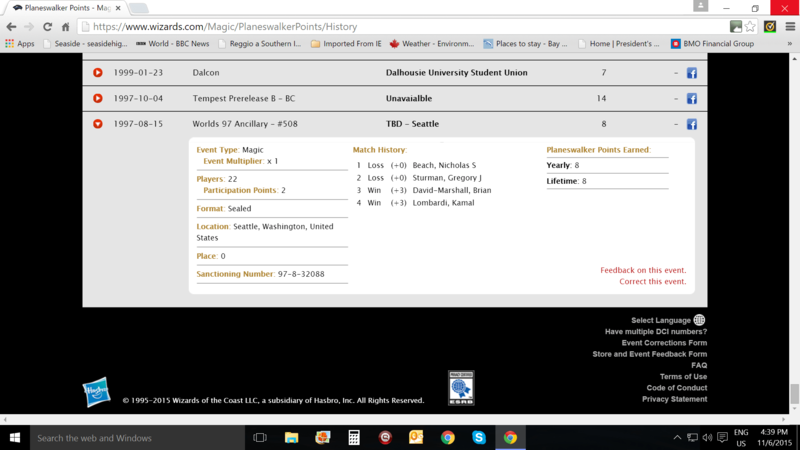 A kitchen-table try-hard, I played my first DCI-sanctioned match at the Wizards of the Coast headquarters at a Worlds side event and, according to the official Planeswalker Points website, my first ever recorded win was against a chap named Brian David-Marshall. This was before BDM got famous by doing podcasts for ManaDeprived. When I walked towards the entrance of WotC HQ, there was a crowd of Magic junkies outside the front door, cracking dozens of booster packs and carefully scrutinizing their contents. The Internet was young, Magic was new, and players were still discovering the game, heads bent low, trying to put together the puzzle. A solitary figure strode out of the building and through the sea of humanity, unnoticed by any, toward me. I recognized him immediately (from a picture in Inquest magazine, perhaps): it was Richard Garfield! I speak with much more authority on the beginning than right now. I can tell you a little bit about what’s going on right now but I don’t work too closely with the details in Magic. But in the beginning — in the very beginning — I set a few basic cost points and then tried to keep everything relative to them, and then I compared things to those costs. The whole costing mechanism of Magic was based on the probability that the more difficult the card was to cast, the longer it would probably take to cast and that was a sort of important part of the equation of whether the card was worth playing or not. And then of course I, at the basic level, tried to compensate for the more powerful cards by making them more difficult to cast. The problems with the original costing were two things: the first was we fundamentally misunderstood things about how trading card games were going to be played so we counted rarity as part of the cost, and we knew from the start that we didn’t want to make the rare cards the most powerful as a rule. And the reason for that was because it was really important to me that if you just bought a deck you could compete with someone that had bought five decks and the only way that can happen is if relatively common cards are very usable. On the other hand, there were some cards that we didn’t cost properly because we thought people would just have one of them in the play group and therefore wouldn’t be much of a problem. So an example of that would be Black Lotus. Black Lotus, as you probably know, costs you nothing and you get three mana. This is a very powerful card, however if you only have one of them, it’s not that big of a deal. It’s not like it’s going to win every game and it’s not even like if you get it it’s going to win every game because you’ll get off to a quick start but me with my very, very common land, I got three mana, it just took me three turns, rather than you, and I’ve still got a land and you’ve lost your Black Lotus. So that sort of balanced, but it only balanced assuming there’s not too many Black Lotuses around because the formula begins to break down. The finances for Magic were a part of the calculation in a way which a lot of people don’t realize. Within the parameters that you were going to construct your own deck, the finances were to make it as affordable as possible. Whereas a lot of people – the first contenders in the trading card game industry – made the mistake of assuming the finances of the game were such that you want to make the most powerful cards rare and therefore make people spend a lot of money. There were a lot of stories, for example, of people who spent hundreds, hundreds of dollars, but there’s also a lot of stories of people who bought one deck and then traded for common cards and then they would win with these decks and then they would trade their common cards away for more uncommon cards and so trick people into the game because the cards were so powerful, right — there’s not many cards more powerful than Fireball or Terror. I said at the beginning there were two problems with cost and I spent a long time answering one of those. The other problem with costing was because we’d only playtested the game for two years with forty people. Now the game’s been much better playtested so certainly I’m not saying we didn’t make any other mistakes than accounting for rarity’s part of the cost. There were just some plain mistakes. Ancestral Recall was just too powerful, for example, and those have been playtested. We understand the costing better. One of the earliest anecdotes which probably unique to Magic among other games is just the way the playtesters valued the cards, and how much it looked like a stock market. Very early I began to draw analogies between free markets and the way Magic cards were being dealt with. So for example very early on cards like Stone Rain—we’re talking before the game was published—were hardly valued at all because they didn’t seem to be part of any competitive decks and then one of the playtesters, Dave Penny, began to collect them all and put them together with cards that combined nicely with them and suddenly land destruction seemed to be an amazing strategy to take. And so in those days the supply of cards was very finite. We’d only made like two decks for each person and he took all the cards he had and traded them away for a huge inflated value and suddenly had a card supply which was second to none. Land destruction became less impressive and the next thing he went to, which was card-discarding, started to go up in price. And so people started to look at what he was doing and actually started to anticipate those things when they saw him trading for something. They knew it would be valuable in the future and those prices started to go up. I knew we had a good game, and knew it was something really different. I had no way to be able to predict its success, there was no precedent there. If I went and relived it again, I’d be very excited [laughs]. As it was I was pretty excited, I was having a lot of fun. Mostly it was still a hobby. I certainly didn’t bank on it enough that I left academics in advance. I worked during the last two years as a [mathematics] professor in Walla Walla, and basically I never would have taken that job if I realized how successful it was going to be. I would have started preparing. Not that I regret it, I like teaching a lot. Early on, I decided to make game design a hobby rather than a career. I was drawing from a sort of broad background of folklore and mythology which I do have, and the reason I chose that is because I believe there is a deep root with most people. I believe there’s a reason why dragons have evolved in many cultures and most myths have strong meanings for a lot of us at different levels. With the five colors of Magic in particular what I tried to do was to get five different aspects and get them all to have interesting relationships with each other. There is a good reason why five and that’s the first number which has a lot of interesting relationships. If there’s N individuals, it’s sort of the smallest number where I started getting the relationships I’m interested in. So what I mean is I wanted to have some colors which have affinity with each other and some had enmity to each other. So when you have three, say, you got a rock-scissors-paper. If A is a friend of B is a friend of C is a friend of A, it’s very difficult because you have to make your friends your enemies. It’s too simple. With four, you sort of have a team situation, right, where you might have A and B be enemies with C and D and then friends with each other but then they’re kind of like a team and so that’s really like two colors. With five, you start to get this relationship where you can have each one being a friend of two colors and an enemy of two colors which can legitimately be allies but still have different interests in the game. Originally, again, I was just doing this as a hobby. And the compensation for Magic was a lot of stock. Okay, so I didn’t get royalty on Magic, I got stock, which means that I own a large part of Wizards of the Coast. Wizards of the Coast and I have a large alliance because of this. Dice would have increased a lot of different cards I could have done. But one of the initial objectives of Magic was that it be a very portable game, and anything we could do without was nice, so my objective was to make it so that you could just play with cards. The original Magic sets and Portal, that’s pretty much done. Magic these days, for the hobbyist, you can have a lot of counters and things, but still we’ve sort of just kept the objective. We do have some coin-flipping cards, that’s our closest non-dice cards. Even those I guess are questioned as to whether they should be part of the game because a lot of people think that the luck in the game should be the luck of the draw, rather than the luck of your flipping coins. They feel gypped when they lose the game because of a coin toss. Any contest with a lot of money on the line, which is the case with the big tournaments in Magic, you’d have to worry about that, so cheating has been a factor. There are trick shuffles, and people have caught on to them, but the tournament rules are set up to take that into account. Whenever I play an opponent in a tournament—in casual play I might cut your deck—but in a tournament I actually shuffle your deck for you. I’m the last person to touch your deck. The tournament rules take into account that you can’t always trust your opponent. It’s much harder for your opponent to abuse your deck than it is for you. Because if I give you a deck and you’re only looking at the back, you’re not allowed to look at the front of the deck, you have to somehow divine what the right order it is to the back to screw me up. And unless I’ve marked my deck, which means I’m trying to cheat anyway, then it’s going to be impossible for you. Chess has been what some people would consider a sport on some levels for a long time and to a lesser degree bridge. And to do it with a game like Magic is very exciting for me. I’ve thought for a long time that games are the mental analog for a sport, it seems very clear, but they don’t seem to carry nearly that stature in our society and I think our society and entertainment would be stronger if it did carry that stature and so I’m hoping it’s a step along that way. There’s an awareness that Magic is more than a game. It’s a hobby. So that would be really weird if people were doing this with Monopoly because somehow Monopoly is much more finite, it’s much more the same thing each time. Magic is more like a family of games. So we see our customers as being people who are coming to us for more for their entertainment than someone who’s just buying something like Battleship or Pictionary or something like that. There’s more of a commitment from our customers, usually. Dungeons and Dragons is probably what made me a games hobbyist. I think it’s an excellent game. It’s one of my founding life philosophies to try as much as possible and so I like variety. I like the theater, I like surrealism, I like art, I like music, and I’m constantly trying new facets of that. For example, we’re going to the opera this season and I’ve never done the opera before. But I’m sort of trying to learn, you know, what makes it tick, what makes people like it, and so that’s a lot of fun. But before the season, I wouldn’t have said I didn’t like, or liked the opera. I just haven’t tried it yet. This section documents Garfield’s reactions to my suggestions for new cards. He highlights the process that turns concept to cardboard whilst completely eviscerating my ideas. The most important principle in designing cards in the game is that you don’t want to make cards which decrease the interest of the set. Cards which decrease the interest of the set are cards which you have to play with, or that make you stop playing with other cards. And so I would be very skeptical that we could get away with a creature that large for only a single red mana. The R&D would have a formula which they would plug it into and it would be off the power curve. What might compensate for that is the fact that you’ve given it a disadvantage. So the question would be: is it a severe enough disadvantage to pay for the fact that if is it was just a generic creature, vanilla, maybe for a red mana you could get a 1/1 creature or a 1/2 creature, I don’t know, somewhere around there, so you’re getting several extra power and toughness and would it be enough of a disadvantage to pay for that? The other question which we ask ourselves with a card like this is should it be common, uncommon, or rare. And it’s very important that if it’s common that it be meat and potato so people can use them very easily. The text this one has about it losing its ability to attack and defend as long as its increased in power wouldn’t come into play that much therefore it wouldn’t be a very good common card. As a rare modifier it might work, I don’t know, but in a common modifier you would want to make sure the text comes into play a lot. The flavor you’ve got for it is fun, so that might be plus in its favor. We probably wouldn’t do anything which is such a close Biblical reference. With the world of Magic, so to speak, we’re trying to create a world and so the less — you want ties to the real world that are at a more subconscious level — you don’t want to look at something and say this comes from the Bible. At first I wanted to make a lot of literary references, like I had Shakespeare giving quotes and Coleridge and things like that. But we decided… it had been decided that it didn’t help build up our own world. Similarly, early on I did an expansion called Arabian Nights which is based on Arabian Nights. And it’s the same sort of thing. But these days we probably wouldn’t do something like the Rapture just because we’re trying to develop our own world. The ability is fun, and in fact very similar abilities have been toyed with by R&D. Something like this may come up, although probably what color it would be would be blue. The reason why it would be blue is because if you look through the card set each color has natural affinities that it has. We give each one strengths and weaknesses. And if a color is doing something which it is good at, a new ability, you look and you try to examine the sort of mechanical flavor of it: Does it fit in a particular color? And if it doesn’t, you don’t put it there or you make it very expensive. Your effect for Rapture—all creatures go back to the players’ hands—is blue. Blue has lot of spells that take creatures from play and put them back in people’s hands or on the top of the deck and things like that. Blue is the tricky color. So this screams out, “I’m a blue effect”, okay? The price might be right if it were blue-blue-blue. If it was white, if you did decide to do it in white for some reason it would be much more expensive because it’s not really a white effect. People would prefer to put it in blue, because if it’s too expensive, nobody will use it and we don’t want to make cards which won’t be used. Nice idea, much too complicated. We often have to wrestle with some of the more complicated ideas; there’s a lot of fun idea behind it but we have to sacrifice it because we can’t do them in a very clear manner. A card from the past that’s an example of that is Doppleganger. Doppleganger and Clone, people love. They were a lot of fun, but eventually we had to remove them. We’re going to try to put them back in a new way, because they were very popular. But the reason we removed them was, you know, customer service was getting calls every day about what would happen if I Doppleganged this and this had something very confusing happen to it. They were just very confusing cards. After the passage of so much time, some of this interview might read as dated, but I feel there is still much of interest to be found in Richard’s insightful way of describing the minutiae of game design. As for myself, I’m glad to finally have had the opportunity to share this rather formative interaction of ours with a wider public. As a footnote: the entire, unabridged article was only ever published in a small run zine format, in The Gypsy Times #36. I’ll be selling the remaining copies of these this weekend, November 14th & 15th, at Expozine (5035 rue St. Dominique, Montreal). Previous articleYorke on Games #7 – Should Booster Packs Have Warning Labels? Next articleChris Ha Wins MDSS Toronto Modern!